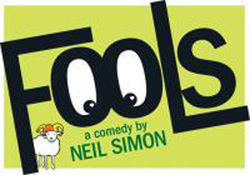 We will be putting on Fools by Neil Simon May 1st, 2nd, and 3rd in the Maxine Theatre. Rehearsals are just starting up, so swing by Tuesdays and Thursdays during ASE in Room 303. Fools is about the love story between Leon Tolchinsky and Sophia Zubritsky in the small, cursed village of Kulyenchikov. The Curse of Kulyenchikov is that every man, woman, child, and domestic animal is utterly and completely stupid. Will Leon and Sophia's love be enough to break the curse? Or will the dreadful Count Gregor get his way and marry Sophia? Come and find out! Comedy at the MERC in beautiful old town Temecula 8:00. Last months performance was sold out so call and order your tickets now! There will be a show on the last Saturday of every month, so if you miss this one, come next month! A Panda Express fundraiser is coming up on Saturday, February 15. It's very simple. All you need to do is eat there between the hours of 11 a.m. and 10 p.m. When you pay, hand the cashier a flyer, and a percent of your total will be donated to the club. The flyers will only work at the Panda Express on 1485 E. Valley Parkway Escondido, CA 92027. Make sure you go to that one, because it won't work at any others. The Poetry Out Loud competition will be in the Maxine Theatre on Friday, February 7th. If you aren't signed up, come support your friends and fellow Thespians! There will be an improv game Tuesday, January 28th at 6:30 in the Media Center. Admission is $3. We will be facing off to our friends from Orange Glen HS. It will be an awesome battle of wits, so don't miss out! Universal Studios is coming up! We are all excited to be going to Universal Studios on November 23rd! Anyone that is going: Bring a sweater and be at the top lot of the highschool by 7:00. Let's have some fun! you to everyone who participated! International Thespian Induction Ceremony - Friday, May 24th, 2013 at 6:30p.m. 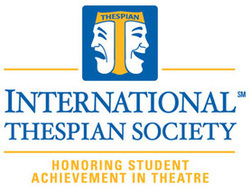 The International Thespian Society is an honorary organization for high school and middle school theatre students located at more than 3,600 affiliated secondary schools across the USA, Canada, and abroad. The mission of ITS is to honor student excellence in the theater arts; its motto is, "Act well thy part; there all the honor lies." We are proud to announce our Spring production of the comedy play by Philip King, "See How They Run." Coming to The Maxine Theatre April 25, 26, & 27 at 6:30PM. Synopsis: So swift is the action, so involved the situations, so rib tickling the plot in this London hit that at its finish audiences are left as exhausted from laughter as though they had run a foot race. Galloping in and out of the four doors of an English vicarage are an American actor and actress (he is now stationed with the air force in England), a cockney maid who has seen too many American movies, a churchgoer Miss Skillion, and a Russian Intruder. This play will have your brain twisted! CONGRATULATIONS MINDY PAUL! - 1st Place at "Poetry Out Loud"
Congratulations to our Vice President of Drama, Mindy Paul, for taking home First Place at the Poetry Out Loud competition! Poetry Out Loud is a contest that encourages the nation's youth to learn about great poetry through memorization and recitation. This program helps students master public speaking skills, build self-confidence, and learn about their literary heritage. Mindy will be moving forward to the State competition in Sacramento, CA on March 25th, 2013 hoping to move forward to Nationals in Washington DC. We wish her the best of luck! On November 6th, 2012, the Valley Center High School improv team, The VC Teehees had a fundraiser match against ASB for long-time VC resident Becca Martinak. All proceeds made that night were donated to Becca and her family for Becca's upcoming surgery. Thank you for everyone who attended Thursday night! Also, a big thank you Mindy Paul and ASB for arranging this awesome event! Valley Center Drama President, Kyle Kittredge, was asked to sing the National Anthem again for November 27th's home game for the Los Angeles Lakers Game vs. the Indiana Pacers at Staples Center. View his performance and the game on Time Warner Cable Sports Net (Avaibale to Time Warner Cable, AT&T U-Verse, Direct TV, and COX customers). 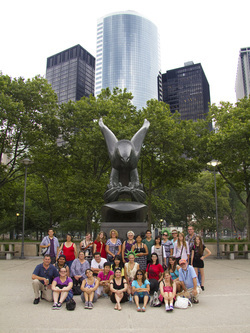 June 19-23, 2012, Valley Center HS Drama Club experienced a trip of a lifetime to the Big Apple (N.Y.C.)! It was the first trip in 10 years where the drama club had gotten the chance to visit New York City! Many memories were made and will be cherished forever! Check out our photos to NYC in our "Photo Gallery!" More photos wil be posted soon. . .
Congratulations to all the newest members of the International Thespian Society Troupe 6199! We are so proud of all your hard work and dedication to the performing arts! Here is the new 2012-2013 Drama Leadership for next years school year! Congratulations! CONGRATULATIONS ~ VC DRAMA 1ST PLACE AT IMPROVAGANZA! Congratulations to Valley Center Drama's Improv team, Comedy Zombies, for winning 1st Place at the first annual Improvaganza! Competitors were Orange Glen HS who took home 2nd Place and Escondido HS with 3rd Place! We couldn't have been more proud! Congratulations to our Student of the Month of April 2012, Caitlin Appolito. Caitlin is a hard working and dedicated freshman in drama club at VCHS. She will continue to strive in anything she pursues! Way to go Caitlin! Fullerton College Theatre Festival 2012 - JoAnna Brown - 2nd Place! 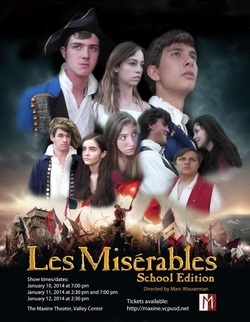 On Saturday, March 17, 2012, Valley Center High School Drama Club attended their annual competition to Fullerton College Theatre Festival and came home with a true winner! JoAnna Brown, a sophomore at Valley Center High School took home 2nd Place with her monologue from "Check Please" in Co-Ed Contemporary Humorous Monologue category. We could never be more proud! Congratulations to JoAnna! Also, a big thank you to Kelsey Rocha for coordinating this event! Disneyland Resort - "SIGNin' in the Street" - ABC Family "Switched at Birth"
We are super excited to announce a very special event coming to Disneyland Resort! On the weekend of March 17-18, 2012 the Downtown Disney District will host a celebration of creativity in the deaf community called SIGNin’ in the Street. Marano, Constance Marie, Lea Thompson, D.W. Moffett, Lucas Grabeel, Sean Berdy and Academy Award winner Marlee Matlin. In addition, two episodes of the show, including an EXCLUSIVE sneak preview of the spring finale, will be screened at AMC Theatres on Saturday, March 17. Tickets to the screenings will be limited, so make sure to check back here to find out how to grab one! The Switched at Birth cast will be on hand earlier in the day for panel Q&A sessions, as well as autograph signings. will host Q&A sessions, sign autographs and perform live. -Musical performances by Tony Award-winning Deaf West Theatre, including a sneak preview of the group’s upcoming world premiere, and workshops for guests interested in learning American Sign Language and acting. -Drum Café, the internationally acclaimed drumming crew, will super-charge the audience through interactive performances and workshops.-Nighttime concerts by popular deaf performers, including singer-signer TL Forsberg, rock band Beethoven’s Nightmare and comic CJ Jones.-Specially created Disney merchandise featuring American Sign Language. The super fun entertainment kicks off at 1pm both days and continues until 9pm Saturday and 8 pm Sunday. 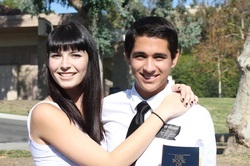 This year at the Role About Theatre Competition in Mission Viejo, Valley Center Drama had two participants make it as finalists; Mindy Paul for Film Monologues (Top 10 - Garden State Monologue) and Kyle Kittredge for Song (Top 13 - "I Believe" from the Broadway musical The Book of Mormon)! They were both thankful to make into finals! This year was a fun and wonderful success! Great job to Kelsey Rocha for directing this event! All of you have been excited for drama to start just as much as we have! The first club meeting is Tuesday, September 20th at lunch in the drama room 303! They will be held every Tuesday at lunch in this room! New members are always welcome! Come join the club because we have a lot of fun activities, trips, and fundraisers planned! This will be an awesome drama year! Be sure to sign up for drama club at Club Rush on Thursday, September 15th in the quad or you can simply "walk-in" on the first meeting to join! We love to meet new faces! KATIE LECLERC NOMINATED FOR TEEN CHOICE AWARDS 2011 - VOTE! 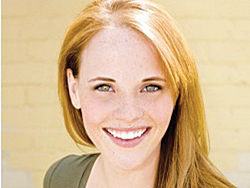 Katie Leclerc of I.T.S. Troupe 6199 is nominated for a Teen Choice Award for "Best Breakout Star" and is competing against her co-star Sean Berdy who plays Emmit. Who will win? Also, her show "Switched at Birth" is being nominated for "Best TV Show (Summer)!" This is Katie's first nomination for a Teen Choice Award and is so excited about it! As we are all excited for her, we all want you to please vote for Katie in her category and for her show! You can also vote for Vanessa Morano for "Best TV Star (Female)" and for Lucas Grabeel in "Best TV Star (Male)" as we are all huge fans of the whole "Switched at Birth" cast! You can VOTE EVERY SINGLE DAY up until the day of the Teen Choice Awards. The Teen Choice Awards will air on August 7, 2011 at 8/7c on FOX. Please cast your votes at www.teenchoiceawards.com! Seventeen magazine and ABC Family are launching its multi-tiered pro-social campaign to bring awareness to the youth issue of online bullying. Kicking off in print, on-air and online starting on Tuesday, July 5th, the Delete Digital Drama campaign will provide outreach through Seventeen magazine and ABC Family media assets, as well as through partnerships with Verizon, a global leader in deliverin...g innovative communications and technology, and specialty retailer Charlotte Russe. Delete Digital Drama will be the focus of Seventeen magazine's August issue, available on newsstands on July 5th. The issue includes a multi-page feature which includes personal stories from readers and ABC Family talent about their own experiences with bullying. On air, ABC Family will begin airing an awareness announcement on July 5th that encourages Millennials to do their part in helping to put an end to digital drama. Enlisted are a broad array of stars from the network's hit series, including "The Secret Life of the American Teenager" and "Pretty Little Liars," and its new summer series "Switched at Birth," "The Nine Lives of Chloe King" and "The Lying Game." In the announcement, the actors speak to the issue, each wearing a t-shirt that spells out the word [delete]. Online, both ABCFamily.com and Seventeen.com have created web pages devoted to Delete Digital Drama, which include the awareness announcement; exclusive behind-the-scenes footage and photos of the awareness announcement and Seventeen photo shoot; and exclusive photos and video from the ABC Family original movie "Cyberbully." In addition, both portals will support the cause through social media tactics on Facebook and Twitter. Fans can show their support for the initiative by adding a Delete Digital Drama badge to their Facebook and Twitter profile photos. These "Twibbons" will be available on ABCFamily.com, Seventeen.com, Twibbon.com and Facebook. In order to further encourage Millennials to take action, ABC Family and Seventeen magazine have joined forces to produce the "Rally to Delete Digital Drama," a live event scheduled for Thursday, July 14th at 4:00PM PT at The Americana at Brand in Glendale, CA. The rally will include appearances by ABC Family talent including Shay Mitchell ("Pretty Little Liars"), Daren Kagasoff ("The Secret Life of the American Teenager"), Skyler Samuels ("The Nine Lives of Chloe King"), Grey Damon ("The Nine Lives of Chloe King"), Katie Leclerc ("Switched at Birth"), Vanessa Marano ("Switched at Birth") and Emily Osment ("Cyberbully"); Seventeen magazine's editor-in-chief Ann Shoket; and a surprise musical performance, as well as an autograph signing and premium giveaways. Also playing a pivotal role in the campaign will be the ABC Family two-hour original movie, "Cyberbully," starring Emily Osment ("Hannah Montana"), Kelly Rowan ("The OC") and Kay Panabaker ("No Ordinary Family"), premiering on Sunday, July 17th at 8:00PM ET/PT. The network will debut a PSA during "Cyberbully" featuring its star, Emily Osment. In the public service announcement, Osment will direct viewers to StompoutBullying.org, providing a resource for viewers and readers to reach out for help, if necessary. Kelsey Rocha has the privilege of attending a leadership summit based on film and the arts at UCLA in Los Angeles. It is hosted by the People to People Student Ambassador Program's and after successfully completing the course she will be a student ambassador. While she is there, she will be able to take part in many activities including shooting on Universal Studios back lots, visit the Hollywood Walk of Fame, and do various workshops with the Stella Adler Studio of Acting and the New York Film Academy. As the day that she heads to UCLA draws closer she becomes more anxious to work with students that share the same passion as her! Our very own President, Kyle Kittredge, will be performing at Conrad Murphys Benefit Concert at Bates Nut Farm on July 16 from 4:00pm-9:00pm. He will be opening the show with a few numbers! Please come and support Conrad and his family at this wonderful event they have planned for them! A benefit concert for injured Valley Center High School baseball player Conrad Murphy will be held on July 16 at Bates Nut Farm in Valley Center from 4–9 p.m.
Tickets for the concert are $10 each, and all proceeds will go to the Murphy family to help defray the costs of Conrad’s ongoing recovery. Conrad, a senior at VCHS, was driving east on Hwy 76 from Fallbrook to Valley Center for baseball practice early in the morning on Saturday, April 23, when another vehicle veered into oncoming traffic and collided with Murphy’s truck head-on. The 19-year-old Murphy sustained a broken neck, broken pelvis and punctured lung, along with serious head trauma. He remained in critical condition for nearly two weeks before moving to intermediate care and then on to the rehab floor two weeks later. The first signs of recovery came when Conrad was able to wiggle his toes only a week after the accident, and since then, there have been marked steps of improvement. He slowly began to open his eyes more and more consistently, and after six weeks in the hospital, he is able to use his knowledge of American Sign Language (ASL), as well as some verbal communication, to talk with his family and doctors. He undergoes physical therapy every day and continues to improve. He is still unable to use the left side of his body, but his family remains hopeful that Conrad will recover fully. Since the accident, an outpouring of support has come in from the communities of Valley Center and Fallbrook, where the Murphy’s live, and from all across the county, state and country. Four bands have already been lined up for the concert, with musical styles varying from rock & roll to country, and the organizers are on the lookout for more musical talent to be a part of the event. The concert will also feature a barbecue and a silent auction, donations permitting. A bank account has been opened for the Murphy’s at California Bank & Trust. Anyone wishing to donate directly to the Murphy family can do so at the Valley Center branch. For more information, or to donate your time, goods or services, contact Pastor Bill Trok at 760-751-9890. To stay updated on Conrad’s ongoing recovery, go to www.facebook.com and search for the group "Get Well Soon, Conrad Murphy." KATIE LECLERC - "SWITCHED AT BIRTH"
Katie Leclerc, a former Valley Center High School student, student of drama, and a member of the I.T.S. Troupe 6199 currently has the lead role on the new ABC Family Original Series "Switched at Birth." We are very proud of all the accomplishments she has received in her acting career! Katie has the role of Daphne Vasquez and performs along side Constance Marie as her mom, Vanessa Morano (Gilmore Girls), Lea Thompson (Back to the Future), D.W. Moffett (Friday Night Lights), Lucas Grabeel (High School Musical), and Academy Award winner Marlee Matlin. 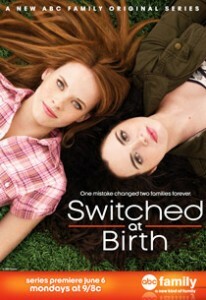 Watch "Switched at Birth" on ABC Family at 9/8c. A Valley Center student who fell in love with the craft and who wouldn’t take “no” for an answer has done what very few young people do: land a starring lead role in a prime time drama on a major television network. Katie Leclerc, a 2005 graduate of Valley Center High School, stars in the ABC Family network drama Switched At Birth as Daphne Vasquez, which premiered at 8 p.m., June 6. The show also stars Constance Marie of The George Lopez Show, Lea Thompson, from the Back to the Future movies, D.W. Moffet from Friday Night Lights, Vanessa Marano from The Gilmore Girls, Lucas Grabeel from High School Musical and Sean Berdy from the movie Sand Lot II. Recently added to the cast is Academy Award winner Marlee Matlin. At a recent visit to the drama class at Valley Center High School, Leclerc thrilled the students with stories of working on a Hollywood set, alongside famous and accomplished professionals, who are so kind and supportive of new faces. Still, she did not sugarcoat the realities of her career, the intense competition, frequent rejections, and long hours. She also shared the many compromises of a “normal life” that occur when acting becomes your career. Her drama teacher, John Ward, told The Roadrunner he believes that Leclerc is successful because she is a “perfect storm” for her profession: passion and talent for her craft, a willingness to work long and hard, the stubbornness to survive countless, heartbreaking disappointments, and the unwavering support of a loving and supportive family. Leclerc is the daughter of Roger & Vicky Leclerc, formerly of Valley Center, and currently residing in San Antonio, Texas.